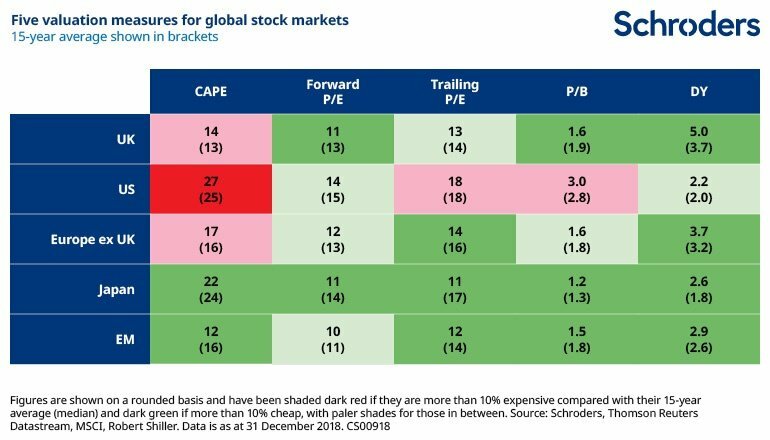 Which stock markets look ‘cheap’ at the start of 2019? | City A.M. I am head of research and analytics at Schroders. 2018 was a rumbustious year for stock markets, with things really coming to the fore in harrowing fashion in the latter stages. With investors having grown accustomed to an unusual oasis of calm over recent years, volatility was back with a bang. Improving fundamentals were behind this shift. Profit growth for 2018 is projected to have been a hefty 24 per cent for the US market, although this is partly down to the Trump administration’s tax reductions. Japan is bringing up the rear with only 3 per cent earnings growth, but it saw its fair share of weather-related troubles in 2018. For more views on markets and the economy you can visit Schroders insights and follow Schroders on twitter.